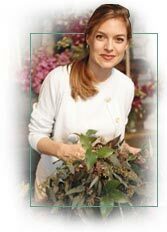 California buyers must submit their state Seller's Permit in order to buy at GM Floral Company. Buyers outside California must submit the Seller's Permit of their respective states. Phone or Fax or Mail your orders. A recorder will pick up any orders phoned in after regular business hours. Locate the item on which you wish to purchase in the picture. Check the letter of the alphabet next to the desired item. Locate that same letter at the bottom of the page. You will see a product description and price for the item that reads. TO ORDER PLEASE GIVE THE PAGE NUMBER, THE CORRESPONDING LETTER OF THE ALPHABET, THE FIVE DIGIT CODE NUMBER AND A SHORT DESCRIPTION. The price in parenthesis is the unit price of the item if you buy it in the larger quantity. In our example, If you buy one dozen of the violets, the unit cost of each is 2.56 rather than 2.85. Should you need to order during non-business hours, our fax machines are available 24 hours a day. Fax No. (213) 489-1909. You may also leave your orders on our voicemail from 10:00am to 5:00am. Voice mail No. (213) 489-7050.